With the increasing popularity of open plan office spaces within office interior design, meeting rooms are required more and more as spaces to hold important meetings, conference calls, private discussions or as places to get away from the noise of your desk area to complete complicated work where concentration is vital. The current design preference for attractive hard finishes such as tiled or timber floors and plastered walls in offices can result in poor meeting room acoustics, reducing quality of sound and clarity of speech. In offices and meeting rooms, poor acoustics will in time reduce productivity and increase stress for employees due to high reverberation noise levels making it very difficult to concentrate. Mistakes will often be made as well due to difficulty in communicating as a result of poor acoustics. For someone that is hearing impaired or suffering from tinitus, these points are amplified and that person is likely to find such an environment uncomfortable and unproductive. Meeting rooms and boardrooms are important spaces where great ideas are born, serious discussions are held and major business deals are signed. The acoustics within these spaces are just as important to consider as the visual design. Nowadays when larger meetings often rely on audio equipment, video and other sound systems for conferencing or presentations the space must be acoustically treated so as not to create a stressful and noisy environment when concentration is key for everyone involved. Oscar Acoustics has a range of acoustic decorative solutions to control meeting room acoustics: from plaster smooth or textured seamless finishes to contemporary design wall panels and acoustic panels that can be suspended from the ceiling to further soundproof your office or meeting room! 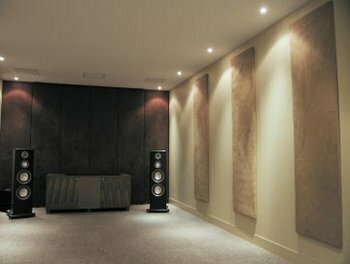 For further details on our office acoustic solutions please click here. Oscar Acoustics has developed a range of panels improving meeting room acoustics. SonaPanel H.E. acoustic panels have a unique and attractive quality faux suede finish with proven acoustic absorption resulting in a high performing but slender stylish panel. We are happy to calculate the required number of panels to achieve your meeting room acoustic goals. Boardroom acoustics, conference room acoustics. For more information regarding our meeting room acoustic materials or any questions regarding building acoustics you can call us direct on 01474 854902 or fill in our online enquiry form and we'll get back to you as soon as possible.